Don't you hate when you can't find what you need quickly and easily? This 5 piece set of 20 oz. cotton canvas tool bags keeps all your small prospecting items and tools organized out in the field or at home. With 5 colors you can designate each for a specific purpose so you don't lose those extra small parts! Also ideal for organizing your office and art supplies. Fill one with toiletries and cosmetics when you travel. Tidy up the glove box or console in your vehicle. The possibilities for use are endless! • HEAVY DUTY 20 OZ COTTON CANVAS: 5 rugged tool bags with woven handles. 12.5 inches long x 7 inches tall. One piece construction means no bottom seam to rip open! 1 each desert tan, olive drab, gunmetal gray, raspberry red, plum purple. • STRONG HANDLES: Woven durable handles allow you to hang the bag from a nail, on pegboard in your garage, or on any hook in your home, bathroom, or hotel room when traveling. • SMOOTH GLIDE ZIPPER: Strong nylon zipper with pull cord will not rust. Doesn't catch or stutter when zipping open or closing. • EASY ORGANIZATION: Tools and parts stay neat and handy in toolbox, garage, car, and at your gold claim or out in the field. Ideal size to corral and organize tools (screwdrivers, wrenches, pliers), loose parts (screws, nails, nuts & bolts) and accessories (adhesives, tape measure). 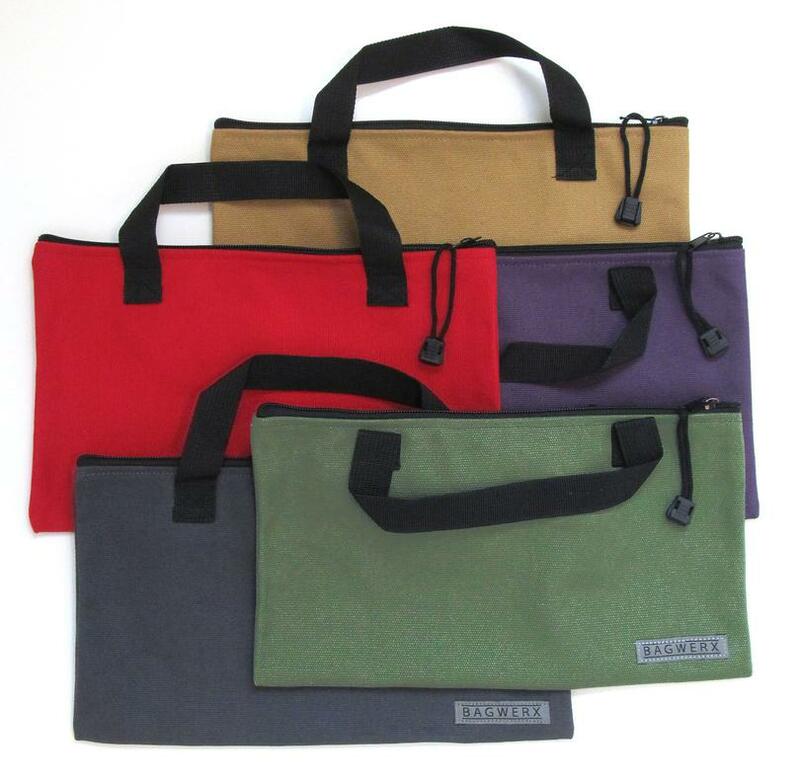 • MULTI-USE: In addition to tools, these 5 color-coded strong canvas bags are ideal for organizing art supplies, office supplies, cords & ties for electronics, gardening tools, toiletries for travel, kitchen junk drawers. Endless possibilities! This item ships separately from other items you might include on your order.